Monday, January 29, begins Catholic Schools Week. It’s a time to honor the unique value of Catholic education. Here in the Archdiocese of Philadelphia, we have a long record of dedicated service by the women and men who teach in our classrooms and run the “business” of Catholic schools. That record includes the legacy of thousands of women and men religious and diocesan clergy. In the single academic year of 1963-64, more than 4,100 religious and 1,600 laypersons taught more than 263,000 students enrolled in our schools. Today, scores of our pastors make extraordinary commitments of parish funds to keep our schools open and excellent. Unfortunately, schools run on resources, not simply good will and heroic service. Our schools can no longer count on unlimited Church support. The resources simply don’t exist. Many of our parishes are financially strained. The archdiocese itself faces serious financial and organizational challenges that have been developing for many years and cannot be ignored. So where does that leave us? We can honor Catholic Schools Week this year by actually doing something about the fiscal problems hurting our schools. We need to press our lawmakers, respectfully but vigorously, to pass school choice. First, we need some clarity: School vouchers do not mean “government support for religious schools.” That argument is flatly false. No vouchers go to any school, religious or otherwise. Vouchers do, however, return the power of educational choice to parents, where it belongs. In doing so, vouchers make all schools more accountable for the quality of education they deliver. Parents get the voucher. Parents choose the school. This makes perfect sense. And if a school offers a poor education for young people, parents will rightly vote with their feet — and their vouchers. Of course, most Catholic schools do the opposite: They offer a strong education, in a safe environment, with a focus on developing good moral character. That’s why parents are so upset when they close. Some people argue that school choice legislation only helps families in poor areas. Helping the poor is obviously vital, and vouchers would accomplish that. But vouchers would also assist many more families than the poor. If vouchers are approved, they will free up what’s known as EITC funds — Educational Improvement Tax Credit funds — along with other grant and scholarship monies for many thousands of other school families. In effect, the positive impact of vouchers translates to millions of dollars of additional educational resources potentially available to a wide range of school families each year — including Catholic school families. Now here’s an unhappy fact: In 2011, the bishops of Pennsylvania made the passage of vouchers one of their priority legislative issues. People like Bob O’Hara in our statewide Catholic bishops’ conference and Jason Budd in our archdiocesan Office of Catholic Education worked hard to mobilize Catholic support. Their efforts failed — and not because they didn’t try, but because too few people in the pews listened. Very few Catholics called or wrote their state senators and representatives. Even fewer visited their offices to lobby as citizens. Despite this, vouchers passed in the state senate, before stalling in the house. One non-Catholic school choice activist — who has poured years of his time and millions of dollars of his own resources into fighting for vouchers as a social justice issue — was baffled at the inability of Catholics to mobilize around an issue so obviously vital to the public interest and so clearly helpful to the survival of their own schools. In the coming week I’ll be writing every state senator and representative in the territory of the Archdiocese of Philadelphia to press them to support school vouchers. And I’ll continue doing it until vouchers pass. I hope my brother bishops and pastors across the state will do the same. More importantly: Our Catholic people need to do the same. Elected officials do listen, and they act when the noise gets loud enough. If nothing else, the crisis of Philadelphia’s Catholic schools is an unpleasant but finally very healthy wake up call. The bill for our failure to pass school choice over the past decade has come due. Now we’re paying for it. 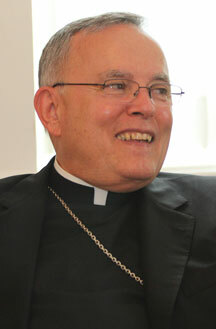 Thank you, Archbishop Chaput, for you courage. There is nothing in our Catholic Faith that precludes us from being good citizens because as Catholics we recognize that the purpose of our unalienable Right to Life, to Liberty, and to The Pursuit of Happiness, is what God intended.